Welcome to the official launch event of inLinx – the unique social media network that brings friends and family closer than ever before while safeguarding your privacy. It’s shaping up to be an exciting evening with top tech journalists, public figures, celebrities and media moguls expected to attend. 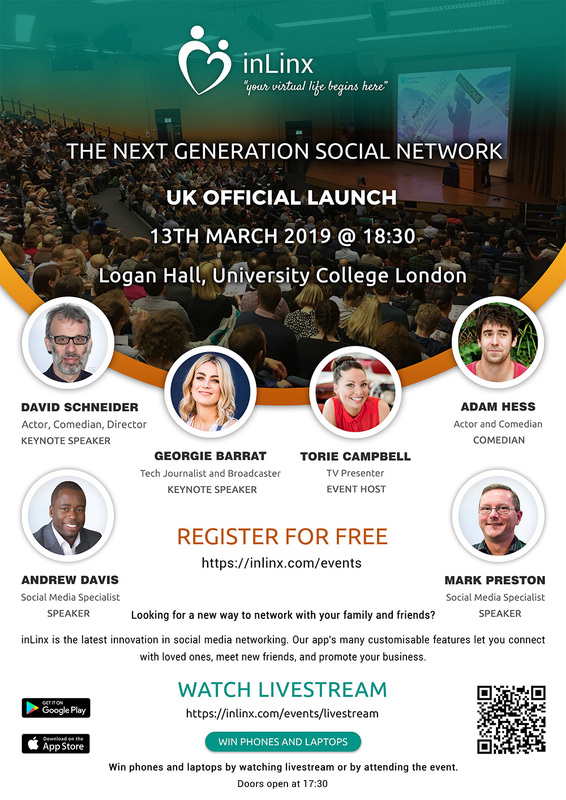 We will kick off the proceedings with talks from key social media speakers about inLinx and the future of social media, plus there will also be stand-up from comedian Adam Hess who was nominated for best newcomer award at the 2015 Edinburgh Comedy Awards. The evening will be hosted by exciting new TV presenter Torie Campbell, with speeches from actor turned social media expert David Schneider, The Gadget Show’s Georgie Barrat, SEO expert Mark Preston, and one of the UK’s foremost social media gurus Andrew Davis.